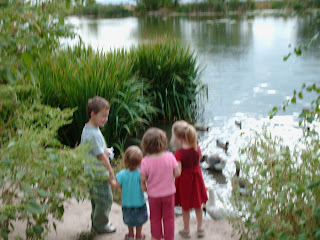 We had most of a loaf of bread that was getting stale so we decided to go feed the ducks at the ponds last night. Kids were all very excited to go. Need to remember to bring extra bread. Never seem to bring enough. I laughed when we were walking down the hill from the road toward the ponds. Across the way we could see some ducks and geese. About the same time they saw us, actually. The geese perked right up, started honking and made a run for the water. 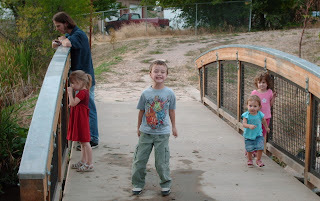 We walked along the path they have there until we got to the bridge area. That seems to be the best place to feed them. 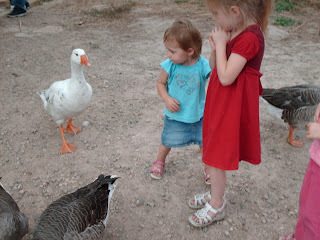 We didn't have to wait long until the geese came waddling over to us. Or rather, right up to us with a look like, "Where's the food?!" Lyssa went running up to one and looked like she was going to try to grab it. Fearing that the goose really wouldn't like that and would let her know, I stopped her before she reached it. She grinned at first as one came right up to her and put its face in hers. Until that started scaring her. It was as big as she is. 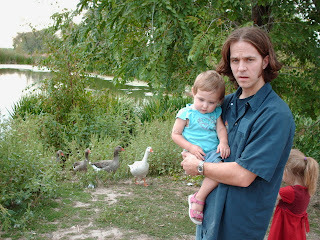 After that she was a little nervous around the geese and would often grab my leg to hide from them. 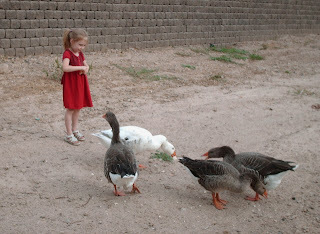 The others were just as nervous when they saw the size of the geese. Despite that, they all had fun and were sad when we ran out of bread to feed them. Here are a few pictures. A couple would have been really cute had they not been blurry. Standing at the bridge during the short wait for the ducks and geese. You can almost tell that Lyssa was trying to get away in this picture. This was one of the blurry ones. Really don't know why it was blurry. 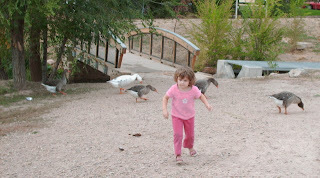 Molly was actually running away from the geese here. 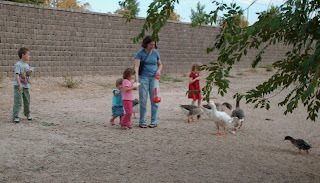 We were about to leave and the geese started to follow us again. I thought it was funny. Ya know, the Wonderbread Outlet (on Orchard Drive in Bountiful) sells "duck bread" - a big grocery bag full for only a dollar or two. Good deal! 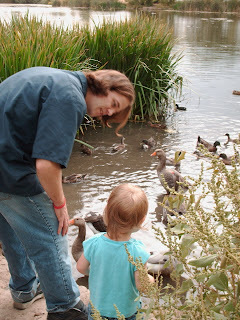 Yeah, I keep thinking that next time we decide to feed the ducks I should head over there and get some bread from them.